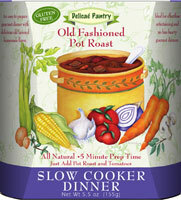 The beefy rich flavor of this pot roast feast brings us back to mom's kitchen. Just add Pot Roast and Tomatoes. This a traditional favorite your family and friends will love! It is suggested to serve in bowls, top with sour cream and chives, and add Dijon mustard or horseradish to gravy before serving.